Common yarrow (Achillea millefolium) is a perennial, cool season forb that is common throughout North America. It is in the Asteraceae (sunflower) plant family. Many references refer to it as a weed introduced from Eurasia while others consider it native to some areas of North America. Regardless of how it got here, yarrow occurs in prairies, woodlands, and pine forests as well as roadsides and disturbed areas. It is relatively drought tolerant and will grow well in partial shade. You may already have it on your property, but if you don’t, it makes a nice addition to any rock garden or wildflower meadow. Once established, it takes care of itself and spreads slowly. Common yarrow starts out as a low growing rosette of “ferny” leaves. The leaves are finely divided: hence the specific epithet millefolium meaning “thousand leaves”. It flowers between May and August (depending on precipitation and/or irrigation). Here, the stems elongate and produce clusters of white flowers atop 6 to 24 inch stems. Once flowers have dried, seeds can be collected for planting the following spring. Seeds should be stratified for a month before sowing. Stratification mimics a cold, damp winter period which many temperate zone seeds require for germination. Stratify seeds by wrapping them in a moist (not dripping wet) paper towel inside a closed zip-lock bag and placing it in a corner of your refrigerator. You can also use moist sand instead of a paper towel. Following stratification, you may sow seeds indoors or sow directly outdoors in early spring. Several references say that light is also required for germination, so sow seeds no deeper that ¼ inch. Germination usually occurs in about one to two weeks. Yarrow can also be propagated by root divisions in spring or fall. There are many varieties of common yarrow that have diverged due to geographic isolation and varying habitats. As with any plant that has potential for use in horticulture, yarrow has been selected from wild population and hybridized. The results include many showy cultivars which include white, cream, pink, red, and yellow flowered hybrids and many named varieties. These are too numerous to name in this column. In Greek mythology, the centaur Chiron, conveyed herbal secrets to his human pupils. One of these pupils was Achilles who is said to have used it to stop bleeding wounds of his soldiers. You have probably noticed the genus Achillea was derived from Achilles. 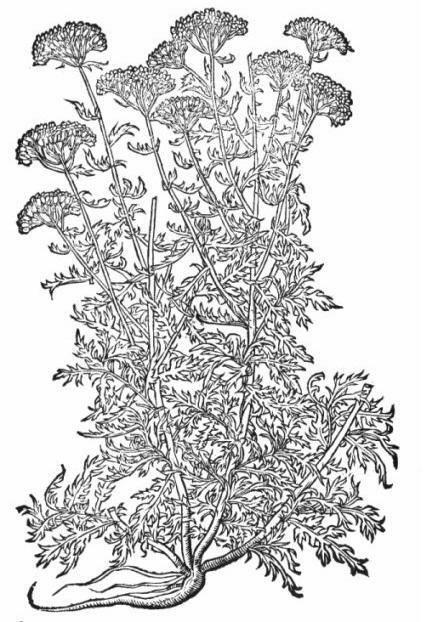 Yarrow was also used in the U.S. Civil War and was known as soldier’s woundwort. Several Native American tribes used (and probably continue to use) common yarrow for medicinal purposes. The Pawnee used the stalk for pain relief. The Chippewa used the leaves for headaches by inhaling it in a steam. They also chewed the roots and applied the saliva to their appendages as a stimulant. The Cherokee drank a tea of common yarrow to reduce fever and aid in restful sleep. The Navajo chewed it for toothaches and used an infusion to treat earaches. Modern herbalists continue to use yarrow. The flowers, rich in chemicals are converted by steam into anti-allergenic compounds. The flowers are used for various allergic mucus problems, including hay fever. The infused flower is used for upper respiratory phlegm or use externally as a wash for eczema. Yarrow has also been used as a quinine substitute and mosquito repellent. The list of yarrow’s medicinal virtues continues. Please note that I am not an herbalist or medical doctor. I am only conveying information I learned from various references. Do not use these home remedies without first consulting a doctor or other qualified health professional. I have lots of yarrow growing in my naturalized meadow areas around my house. It grows vigorously in the spring, takes a break during the drier months of May and June, then bolting into full flower with the summer rains. I also remember a camping trip over 30 years ago where we built a sweat lodge next to the Stanislaus River and hung bundles of yarrow from the ceiling. I think one of the girls read about it somewhere. The University of Arizona Cooperative Extension has publications and information on gardening and pest control. If you have other gardening questions, call the Master Gardener line in the Cottonwood office at 646-9113 ext. 14 or E-mail us at cottonwoodmg@yahoo.com and be sure to include your address and phone number. Find past Backyard Gardener columns or submit column ideas at the Backyard Gardener web site: http://cals.arizona.edu/yavapai/anr/hort/byg/.